The EJOT facade anchors are plastic anchors for multiple structural fastening or embedment of non-supporting systems according to ETAG 020. The anchors are suitable for all common substrates and are characterised by their specifically developed expansion zones. Different building materials require bespoke fastening solutions that are specific to the substrate. For the selection of the best fastening solution it is important to consider the building material, the way of fixing and the substrate. 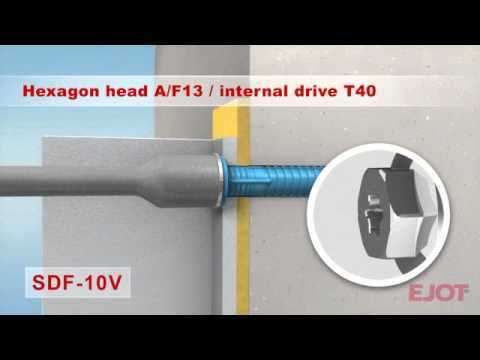 For fast retrofitting, tack-free securing and embedment of outer sheet, EJOT recommends the VSD cavity wall repair anchor. It is suitable for load-bearing shells made of concrete, solid brick and perforated brick. The EJOT insulation support anchor DH is particularly suited for fixing insulating material to all substrates in the rear ventilated facade (VHF). It prevents "quilt effect" (indentations in the insulation) caused by retrofitting of the washer and thus the opening up of the joints between the individual insulating panels. Practical for warehousing: Packing and handling volumes are reduced by over 60% compared to one-piece insulation support anchors. For fastening insulating material for high fire protection requirements (cellar ceiling insulation, insulation close to escape routes) the EJOT metal insulation support anchor DMH is recommended. The ND-K and ND-S nail anchors are outstanding speed plugs for light fixings: substructures, cabinets, skirting boards, laths, cable racks, cable clips and pipe supports. The GRIPPER multi-wall plug is made of thermoplastic elastomer. It is ideal for installation in concrete, gas and aerated concrete, structural panels and cavity wall constructions. Its grippy surface ensures a reliable hold.